Trang Nguyen wants to be an English teacher in her homeland of Vietnam. She is a happy and confident teenager with a bright future ahead of her. But just a few months ago it was a very different story. 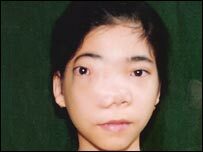 For when Trang was just 10 she developed a massive facial tumour - known as a fibroblastoma - which grew so large it distorted her face. It pushed on her sinuses, brain and cheekbone and she nearly lost the sight in one eye. It also had a detrimental effect on her confidence. "When we first met she was such a slight little waif," said Sarah Driver-Jowitt, executive co-ordinator of the charity Facing the World, which arranged 15-year-old Trang's surgery. "She was absolutely tiny and used to hold herself even smaller, if it was possible, so that no-one would notice her. "She hid under a huge white peaked cap and would barely look up underneath it. Her arms were always folded and her shoulders hunched as if she wanted to disappear entirely. "When we spoke to her about home, she said it was very sad because she did not have any friends." 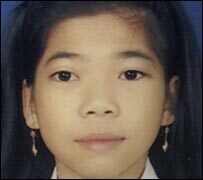 But Ms Driver-Jowitt said the Trang who recently returned to Hue City in Vietnam following surgery was a very different child. "She is very bright child and comes in the top of nearly all of her subjects but what I love about her choice of English teacher as a career is that it is one that is very exposed. "She will be standing up in front of the very students that she was so intimidated by for so long - a group that she now feels so confident in her abilities that she wants to teach." Trang had surgery in Vietnam to try to remove the tumour but it had continued to grow and she needed three further operations at the Cromwell Hospital and the Chelsea and Westminster, in London, in June, July and August. The team of top consultants, including craniofacial plastic surgeon Niall Kirkpatrick, ear, nose and throat (ENT) surgeon William Grant, and oculoplastic surgeon Naresh Joshi, removed a tumour the size of an orange and then rebuilt her face. Mr Kirkpatrick, who, along with the rest of the team donated his services free to help Trang and the charity, says her prospects are now good. "She can look forward to a healthy future, she will have regular check-ups in Vietnam. "When she originally presented she was originally quite facially disfigured by this benign tumour, which was continuing to grow and grow and her eye was getting more and more pushed outwards. "They are not common tumours although we tend to be referred them because of what we do as craniofacial surgeons. "The problem for her was that we needed to remove the tumour and then we needed to push the eye back to its correct position and to reposition the bones of the face. "The surgery involved opening up the scar from the surgery she had in Vietnam to allow us to remove the tumour. "Then using an incision inside the eyelid we then cut the bones and rotated the bones of the face on the right-hand side through 90 degrees and then released some fat around the eye to allow the eye to drop backwards to the correct position. "We managed to get her eye exactly where it should be. "We have got the face pretty symmetrical now and really she should do very well." The British Academy of Cosmetic Dentistry is donating its fees for tooth whitening to help children like Trang through Facing the World in an initiative dubbed Smiling for the World. Ms Driver-Jowitt said this was a welcome boost. "One in 250 children suffers from facial deformity and one in 20,000 has a serious craniofacial condition," she said. "At Facing the World we offer surgery to children from poor countries across the globe that have no other chance of finding help to overcome their disfigurement. "The Smiling for the World project could mean not only putting a smile on the face of one of these children - but possibly the difference between life and death."